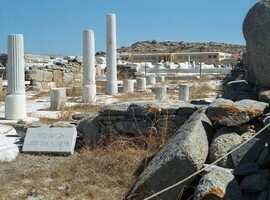 Delos is located in the heart of the Cyclades, between Mykonos, Tinos and Syros and it is a narrow piece of land from shale, which relies on bare soil on the surface of the archipelago. 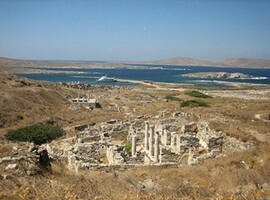 You will land on the ancient port at the west coast. 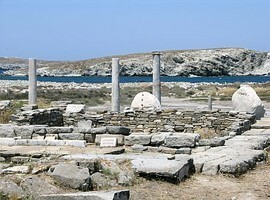 In front of the pier you can see the square Ermaiston or Kompetaliaston (Liberalized Romans and slaves Association), an open paved square with shrines chapels and shops, in which there were the established guilds of Italian merchants. 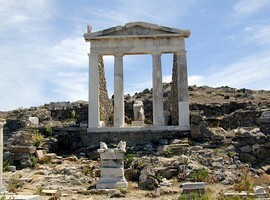 From there, the ancient road passes by two galleries, one of the Macedon king Philip and the other of kings of Pergamon. 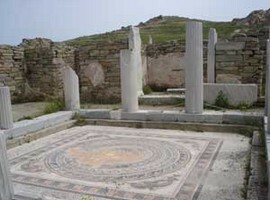 Behind the south arcade there was the square named “Market of Delians”. 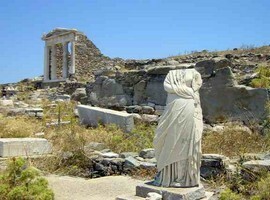 The Sacred Way between the two galleries brings us to the sanctuary of Apollo. 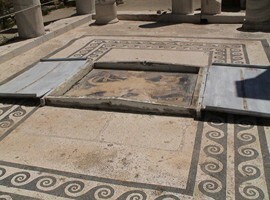 The entrance was through a monumental entrance. 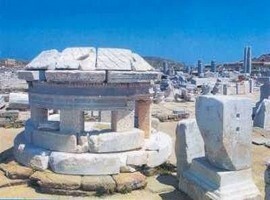 We must imagine the shrine of the god initially as an open space filled over the centuries with buildings, temples and porticoes. 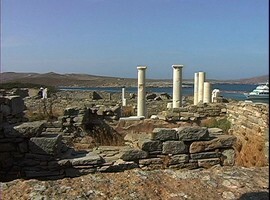 The “house of Naxos” is the first building that we see in our left hand and one of the oldest of the Ionic Period of the Temple. 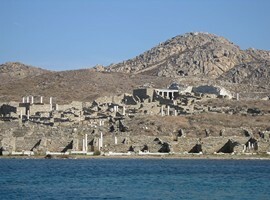 A few meters further north there are the three temples of Apollo, with the oldest one dating to the 6th century BC. 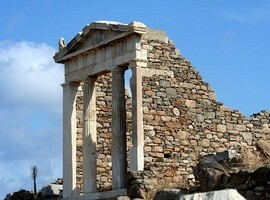 The southern temple, known as the “temple of Delians” was the dominant church of the sacred and the official church of the Athenian Alliance. 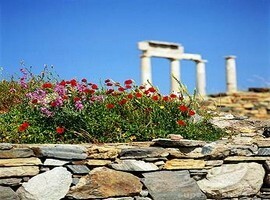 Although its building began in 478 BC, the work was abandoned two decades later, when the allied treasury was transferred to Athens. 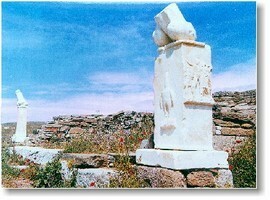 The temple was not completed until a century later. 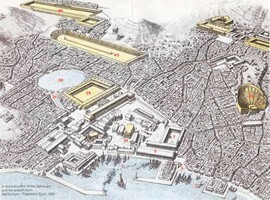 Public administration buildings of the city could not have been located away from the temples. 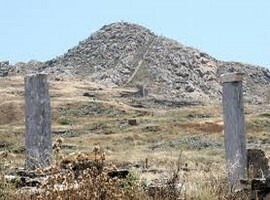 East of the temples have been excavated two separate buildings which have been interpreted as “deputies” and “deanery”, while just behind them is the “Monument of the Bulls.” It is an oblong building which reached the 68 meters. 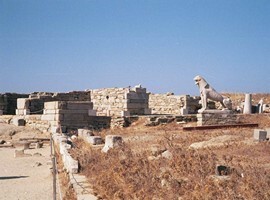 It was erected around 300 BC to house, it is believed, a war trireme dedicated to the temple probably from the king of Macedonia, Demetrios Poliorcetes after a naval victory. 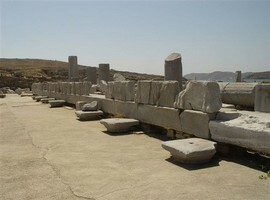 The north side of the sanctuary is flanked by a huge gallery of Macedon king Antigonus Gonatas with a length of 120 meters. 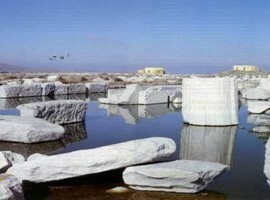 Unlike common galleries, the gallery Antigen was not of commercial nature. 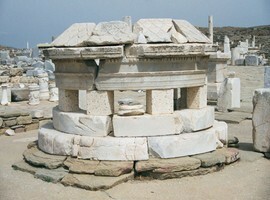 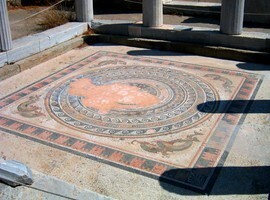 It housed the offerings of Macedonian dynasty. 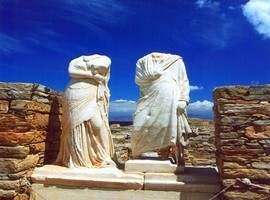 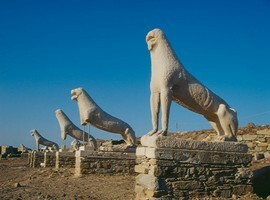 Among the Italian Market and the Granite Monument, extending to the north, you can see most famous street of Delos, the “Street of Lions” with sculpted marble lions on its side. 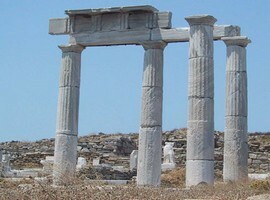 They were votives of residents of Naxos (which was famous for the glittering marble) at the end of the seventh century BC. 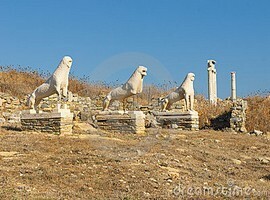 Nowadays there are only five of them but their original numbers probably exceeded ten. 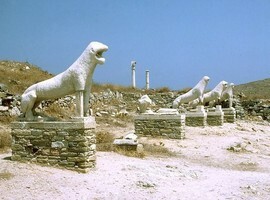 They have suffered extensive damage from wind erosion, which over the years brought dramatic reduction in their size. 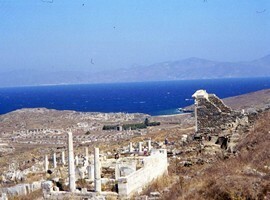 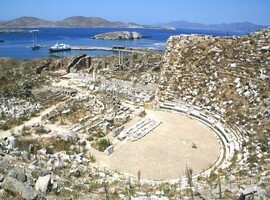 The Delos stadium is had his own district, a gymnasium and a temple dedicated to Apollo Archigeti, the mythical founder and first king of Delos. 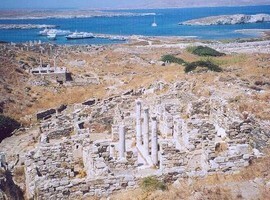 The usually three hours lasting organized tours of tourist boats are sufficient only for a quick passage through the various neighborhoods. 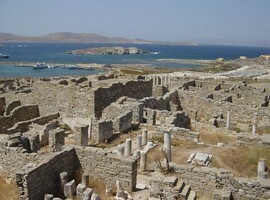 For anyone who cares to know Delos with more comfort, stand in front of each building and to reconstruct it in their imagination, should devote two days. 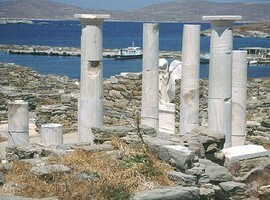 The visitors are prohibited from staying on the island after sunset.